The submission window for Deathscribe 2018, the 11th Annual Festival of Horror Radio Plays, is from May 1 to July 31, 2018. Submissions are accepted through our online submission form. Every year we seek 10-minute radio scripts that are genuinely scary, imaginative, chilling, intelligent, suspenseful, horrific or downright grotesque. Writers may submit up to two radio plays to Deathscribe in any given year. Five scripts will be selected from all submissions. These five pieces will be performed on stage in front of a live audience. The writer of the winning piece, chosen by a celebrity panel of judges, will receive the coveted Bloody Axe Award, as well as a $100 cash prize. 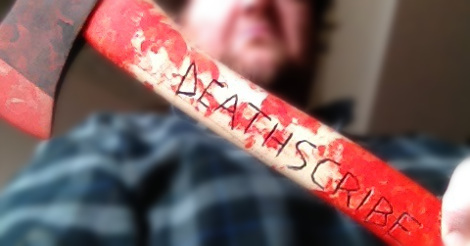 Writers may submit up to two (2) scripts for Deathscribeconsideration in any year. Deathscribe selections are blind. The title page should include the title of the script, names of all authors, and the address, phone and email address of the author(s). The subsequent pages must include only the manuscript title and page number and NO identifying personal information (name, address, email, etc.) or it will be disqualified.